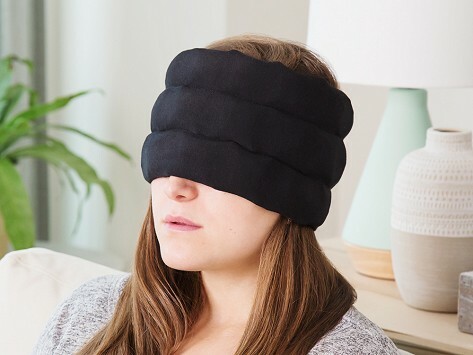 Cool comfort from a wearable ice pack that delivers icy relief from migraines, headaches, and even hot flashes and fevers. The roomy, comfortable design can be worn over the eyes to block light, and has extra fabric to act as a barrier if needed. Inside the stretchy wrap is a reusable ice pack with individual cubes filled with purified water (longer-lasting than gel ice) that help you target the cold right where you want it. Made in the USA. Dimensions: 23" x 6" x 1"
I purchased a second one should be enough to tell Grommet this is a great product. I’ve used it twice now for headaches—and once for a backache. It works very well. Headache Hat Maker Sherri Pulie was in the midst of a migraine when she began trying to distract herself by thinking up a better way to ease headache pain. The dripping plastic bag of melting ice she was using just wasn't cutting it. Her comfy, wearable solution ditches the baggies and frees up your hands. The stretchy wraps each have a reusable ice pack inside that's filled with purified water. This creates ice that's harder and longer lasting than gel ice, and because it's housed in individual cubes, you can better target pain points and feel cool relief right where you want it. One can lend its icy touch to help cool hot flashes, fevers, or even when you're working out. We like how Headache Hat stays in place so you can go about your day, and it feels just as good when you want to sit back and relax.